Dr. Chris Meletis is the former Executive Director of the Institute for Healthy Aging and has written 18 books on the subject of health, fertility, and natural medicine. Chris talks to Jason on the benefits of hyaluronic acid, how to keep your body healthy, hair loss, and more on today’s show. 1:50 – Chris explains what hyaluronic acid is. 5:10 – By definition, people can not be deficient in hyaluronic acid. 11:40 – Why do we have cravings? 14:30 – Chris talks about his three, two, one plus one diet. 18:05 – Eating frozen vegetables is probably better than eating ‘fresh’ produce at the supermarket. 19:45 – People lose their hair faster when they are stressed. 22:00 – Chris touches quickly on the subject of fertility. 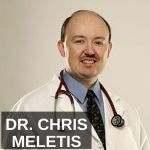 It’s my pleasure to welcome Dr. Chris Meletis to the show. He is the former Dean and Chief Medical Officer for the National College of Naturopathic Medicine. He is the former Chairman of International Association of Naturopathy and 2003 Naturopathic Physician of the Year. He is the former director of science and research for Trace Minerals Research and former Executive Director of the Institute for Healthy Aging. He’s author of several books including The HA Anti-Aging Answer: Using Hyaluronic Acid for Flexible Joints, Vibrant Skin and a Healthy Heart. Dr. Chris Meletis, welcome, how are you? Hey, I’m doing great, thank you, Jason. Yeah, it’s good to have you. So, let’s first, we can cover a lot of things on this interview, but you know, first I’d like to hear a little bit more about hyaluronic acid, I think a lot of people know about it in the skin care arena, but it’s useful for a lot more than that, right? It is and what’s amazing is when we look at the human body, made of 50-75 trillion cells we think, but what helps keep it frame, its structure, the integrity, and large part it comes to hyaluronic acid and lot of people ask the question, well, if it’s an acid, isn’t that a bad thing, because I mean, after all we think of acids as something which is hard on the body. Actually, acid is merely a molecular structure and when in the case of hyaluronic acid, it’s actually soothing, relaxing, and supportive. So, hyaluronic helps everything from the back of our eyeballs, so think about all the eye health issues to the suppleness of our skin and are we looking as young as we could, we might feel young on the inside, full of vim and vigor, but we’re getting a little wrinkly where it’s showing that mild on our tires and same thing with our joints and our internal connective tissues and even something a fancy word called the extracellular matrix, which is – it’s in between everyone of our little cells and it’s, in my opinion, what’s going to be the next big push on drug therapies and natural therapies is taking care of that extracellular matrix and hyaluronic acid does that. So, how do we consume hyaluronic acid, I mean, certain it’s in creams and lotions and so forth, but is there a supplement we should be taking. Is it an injection like vitamin b injections? Great question. So, in the conventional model, the, what I term the AMA model, the American Medical Association model, the orthopedic surgeons use it often with joints, eye doctors, ophthalmologists, so the MD eye doctors, will often use it while doing eye procedures and at the same time, the dermatologists and cosmetologist will use it as injection underneath the skin. In my clinical practice of 22 years, I used it as an oral supplement and a topical serum and that actually allows for, basically, non-invasive way of delivering hyaluronic acid into our bodies, which is critical important, because when we think of a baby, they have baby-soft skin. Our skin is not quite as soft as baby-soft skin and they don’t have wrinkles, we have wrinkles, part of that is the aging process and free radials and what not, but part of it is because we don’t make as much hyaluronic acid and not as higher quality as when we were younger, so it’s kind of like, it’s a catch 22, we need this more than ever because we have mild on our tires. We show the wear and tear on our bodies and within our bodies, but we just not making as much, so we have to supplement it and we can do it as a lozenge and we can also do it topically as a serum. So, are people deficient in this or is it just that we want to be more youthful or is it something where, you know, for example, a lot of doctors have told me people are just deficient in vitamin D, you know, D3 is a huge deficiency in our culture from what I understand. Is this something people are really, truly deficient in or are we just trying to find the fountain of youth? I think it’s a little bit of both. Officially, we can’t be deficient in hyaluronic acid, because only a vitamin or a minerals we can be deficient in and by definition it will cause a disease, so if you look at any vitamin out there, like vitamin A or D or E or K or whatever, there has to be a disease associated with the deficiency, so for example, if you have vitamin C deficiency you have scurvy. If you have vitamin B1 deficiency, you have beriberi, vitamin B3 deficiency, you have pellagra. All disease due to nutrition true deficiency, but I would ague we’re insufficient in hyaluronic acid and particularly because we’re heavy, we sit more, we’re less conditioned, and I have a simple equation I share will all my patients, wear and tear minus repair. So, they give the wear and tear under your body, minus the quantity of repair. Hopefully your level of repair is like using hyaluronic acid, (#5:50?) sulfate, and other things is commensurate with your wear and tear, but the moment wear and tear exceeds the level of repair, you start having the aging process in the body whether it be the skin, the joints, your ligaments, your tendons, so hyaluronic acid comes into play at that level of helping mitigate the wear and tear by helping augmentative support repair. Okay, so those are some good distinctions, thank you for that. Now, one of the things that we’ve always got to be, you know, kind of concerned about, I guess, is that the body has so much wisdom just built into it, when we supplement with things, in certain cases, does that just give our body a signal that, hey, there’s enough here, I don’t need to make it anymore, because this is something the body makes, right? And you’re 100% correct, it’s a concept, like for example, we give somebody thyroid hormones or male or female hormones, we create a dependency state or back when I was in medical school we used to call it a welfare state, which of course we don’t use that term anymore because it’s not politically correct, but your body eventually says, hey, while I get a hand out, if I get a fish everyday, why do I ever need to fish? Well, in the case of hyaluronic, hey, it’s kind of a simple approach and so with hyaluronic acid, we don’t have that kind of feedback loop as much as we have with other kinds of hormones and substances in our body, so it’s more of we’re augmenting and often I’ll describe to a patient, let’s say when we have an adrenal burnout or adrenal fatigue, there are classical, rechargeable batteries, so we have a smartphone, we have our blackberries, we have whatever, but they’re only as good as the charge that they have. If they are out of batteries, they can’t function. So, likewise, when there’s not enough building blocks in our body and/or we’re using up our ability, kind of just maintain the status quo, level playing field of my state of brokenness, my state age-ness, then of course we want to replete the body and allow the body to have a little bit of a rest and actually start playing catch up. I give the example of what I term the ‘health savings account’. So, we have credit, you’ve slept well, you’ve ate well, you’ve been drinking, been taking care of your elimination of toxins from your body and those are all credit, but then we put in the negative, well, the chemicals in our environment, the chem trails, the Glade plugins or other smells out there and all these things and all those are negative. So, what we look for is, what does hyaluronic do? It adds to the positive. It allows our body help support and make up for the some of the wear and tear on the health savings account on a daily basis. Is there a way we can get our body to produce more of it naturally? You talk about the health savings account and the negatives. I mean, for example, if we just exercise more, will we produce more of this? Exercise would actually generally produce more. It would actually cause more wear and tear. Now, staying limber, staying fit, critical. Of course, the more the weight we carry around, the more wear and tear and that’s when I use products in my practice to help people maintain their lean body mass, but there’s only one active way. It’s called a sticky fruit and actually Connie Chung did a report on this 10-15 years ago and I think it was like, I can’t remember the news show, where they found a culture in Asia, which was actually eating this sticky fruit, which we don’t have in the United States and it’s a traditional Asian fruit or vegetable and it’s actually allowed for them to actually stand in the sun and smoke and do all of these things, but not look as aged as they are on the outside. So, there are some fruits and vegetables that have a little bit of that capacity, but not nearly enough for the average westernized person, because our wear and tear, once again, exceeds our level of repair. Right, very interesting. So, you’ve written, I think, about a dozen books, right? Tell us about some of the subjects and let’s talk about, you know, some of the other areas that are important. Obviously, we are in an obesity epidemic and I know you’ve got something out about that recently, but whatever you want to take it. Yeah, I’ve written, like you said, a dozen book and I have a couple more coming out. One is on oxygen therapy, another one is the power of green, not just the color green, but what’s important (#10:09?). I would say, you know, written on fertility, I’ve also wrote a book called Great Health. So, let’s catch up on the obesity thing, because we’re at the beginning of the new year, we’ll talk about that for a moment and we’ll move on to some other topics, like I talk about save herbs and drug nutrient interactions, and also herbs and nutrients for the mind, but on the obesity side of things, when we woke up in the morning and we look in the mirror and say, I don’t remember being that heavy and, you know, Rip Van Winkle, all of a sudden like, how are in the world did that happen? My hairline has receded and I’ve got weight and inches where I never thought I was going to have inches, because we all remember back in highschool or even earlier, lean and mean, so to speak, we’re ready to go and all of a sudden we’re like, tired or we’re wired and tired. So, what I do in my clinical practice, family practice here in Oregon, is we look for helping mitigate things. So, transition from the hyaluronic acid conversation where we have extra wear and tear, like carrying the weight around, I’ll use simple things that help bind the fat in the diet. Like, there’s a special fiber called cyclodextrin, which binds up to 486 calories of saturated fat. So, sure you want to eat well, you want to exercise and at the same time, now if you have a little bit of way to fudge some of the indiscretions in a day with a simple fiber, it gives you that extra little edge. Good stuff, good stuff. So, in terms of cravings, why are eating all the wrong foods? What is the cause? The food is just junk, it’s just such low quality most of the time, we just feel hungry all the time? I notice when I eat fast food, that’s how I feel. It doesn’t really satiate me for very long. That’s the trick is we now are servants to our technology so we have all this asking of ourselves, we got our emails and our texts and our telephones. I think we all remember the day or most of us will remember the day where you weren’t home, there was no answering machine, so if they needed to call you, they’d call you back. Those were the simple days and now we’re so fast paced now all of a sudden fast food like, we’ll, okay, I’m going to go through the drive through, boy, they’re not very fast here, I wonder why they’re so slow today and then we eat our foods and lots of people will make that mistake and, of course, it’s high in sodium, high in saturated fat, and that’s when I use the cycle of death (#12:28?) product called calories and then at the same time, why? Because we are basically having more processed food. Think about the concept of should we eat organic. Now, that’s our grand parents, our great grand parents never asked, because everything was organic! Unless they put some fish fertilizer, but that was even organic with the organic fish from the fairly pristine river of our great grand parents. Everything by nature was organic and now we’re going back to the concept of what are we eating and there’s an interesting statistic out there that 200 years ago, there’s not 21 inches of top soil in the United States, now there’s about 6 inches on much of the farm land and so, if you think about Little House on the Prairie and Charles and Caroline Ingalls and the genres that I grew up in the 60s. Well, you watch these shows and you’re like, okay, Charles has this new virgin piece of land and tills that land and he takes the corp to the mercantile and, of course, nutrients go from the soil into the plant into the mercantile and then eventually into the people, but year after year the same land is being tilled and worked, they’re not adding in the trace minerals back, they’re not adding the other nutrients, the micro and macro nutrients. They’re adding in some iron and some nitrogen, so you have green and lush, but you’re not getting a lot of other nutrients, so we’re actually under nourished and lot of the trace minerals like chromium —, all terms that lots of doctors still don’t even know the word, but they all have functions within our body that now all of a sudden when you’re low on chromium, you will crave more carbohydrates, because you don’t have blood sugar regulation, so you go up and then you go down and so I call chromium will power in the bottle, for example. Very interesting, so do we just need to take, you know, 40 vitamin pills every morning and a bunch of supplements or what’s the easy way to do all of this? I have an approach in my Great Health book, which is called the three, two, one plus one diet and if you were to think about what society does and doesn’t do in the westernized world, what we don’t eat is our vegetables. Mom is right, we need to eat our veggies and it was in a 2007 medical article that said only 11% of us eat our 5-7 servings of fruits and veggies. I mean, 89% of us are epically failing and so my three, two, one plus one diet is you should throughout your day, if you were to add up all your foods, it should be in portion, three veggies, two fresh fruits, one grain, not a lot of grain, and a large source of protein and that should be your ratio. I describe it this way to my patients, if you actually had to go chop down a sugar cane in Hawaii and then mill it up and then make it into sugar, how much sugar would you end up wanting to put on your cereal or in your coffee? Not much if you had to work for it like that. Exactly! And the same thing, if you and I had go tilled the soil, feed the horses, plow the plow, and then grow the wheats, and then mill the wheat and then knead the bread, I could tell ya, I better cut if off at once slice. I better make that loaf of bread last a whole heck of a long time. So, three, two, one plus one. Three veggies, two fruits, a grain, which can include rice and oats and other things, corn, which is also, of course a grain and not a vegetables and a large source of quality lean protein, ideally not farm raised and not genetically modified and not full of hormones. Yeah, so this is really kind of a, maybe a low key version of the Paleo diet then, right? Yeah, it’s ancestral diet and it’s like, hey, you wouldn’t put a whole lot – you’re too busy surviving to go into it. I actually wrote that book about 10 years ago before Paleo was big and just applying common sense. There’s not a whole lot of fat rabbits out there. I’ll just leave it there. Yeah, good point, good point, for sure. In that three, two, one ratio, I really like that, because that simplifies things a lot. Vegetables, vegetables are so important. I happen to be one of those, maybe somewhat rare people who loves vegetables, but you know, how should we consume our vegetables? For example, I’ve heard people say that frozen vegetables are actually better and fresher than what we consider fresh vegetables, because of the time to market and so forth. If we microwave our vegetables, does that take out all the nutrients, you know, those kinds of questions on the veggie side. You’re asking tough question and also very controversial questions. Yeah, I don’t know if anybody knows, really. Yeah, well, of course, there’s the whole big thing like microwaves have been banned in certain countries and we’re slow here in the United States and North America and other westernized worlds that we’re still using microwaves and they’re like, hey, we can watch a little carousel go around and around. Like, no, don’t do that, you’re microwaving yourself indirectly, because lots of times we have leaking microwaves, which actually leak out microwaves into the environment. So, I do agree that a lot of the produce that we import from other countries, no matter what country you’re in, actually has been picked early and basically imported and lot of those nutrients aren’t there. It’s better to have something that is fresh and pristine and then frozen immediately than to having something that’s been on a boat or a barge for 30 days and kind of artificially kept in suspended animation, so I would definitely say the answer is yes on that. I’m a big fan of farmer’s market and buying locally. Is that a yes on fresh or yes on frozen. I would say yes on frozen. I think definitely frozen if it’s done right and there’s no question and fresh is good if we do it through a farmer’s market. Buy locally, think globally. So, support your local people, get it from much like our great grand parents and our grand parents and even myself as a kid, I grew corn, I grew carrots during the summer and pumpkins during the harvest season and it’s, once again, it’s from my backyard and it was literally from the yard to the table and immediately full of vatalitive life, enzymes and the nutrients and, you know, there’s a saying, live food for living people, dead food for dying people. Heavily processed things or things that have been dead on the vine and kind of kept in suspended animation, these are becoming more and more devoid of nutrients or tomato that’s picked green, it’s going to take this long to get to market and then it’s artificially, basically ripen. No, you want something right off the vine and into the dinner plate, dinner table. Just like the way nature meant for us to eat it, imagine that, right? Hey, what a concept. It’s like, hey, let’s rediscover that concept. Yeah, absolutely. Very good concept to rediscover, no question about it. You talked a few minutes ago about thinning hair. Is there a good supplementation program for that? I think we’re on the verge of hearing a FDA announcement for stem cells therapies and so forth, which is pretty fascinating, but what about hair loss? A lot of people suffer from it, male and female, actually. Well, part of the hair loss and actually there’s a theory that I came up with called the NESID theory and I go around the country lecturing the medical doctors on the latest cutting edge concepts of how does our body talk to us and the NESID theory is Neuronal (#19:59?) Stress Induced Dysfunction and a lot of times you’ll know that people lose their hair or have a accelerated hair loss, maybe they were losing their hair, now they’re really losing their hair when they’re stressed and that’s because our stress hormones, just like gas lean in the car, have to be eventually combusted and broken down, metabolized, and they’re metabolized through an enzyme, fancy word, (#20:20?). It’s the same enzyme in men and women a like that can convert testosterone, so women have it too, of course, into DHT, dihydrotestosterone, which contributes to what has been termed up male patterned baldness, but equal opportunity here, women can have it too. So, a lot of times after surgery, medical procedure, life event, something sad within our immediate family and loved ones, we will start shedding our hairs. So, essentially the seasonal thing is actually a stressed-induced thing. So, I would say, yeah, you’d want to make sure you got your zinc, you want to make sure you’re basically helping protect those pathaways and we need to not sweat the small things. Today’s world is way too chaotic and basically our skin and our hair reflect the wear and tear, so we need to safe guard ourselves by creating a little psychological/spiritual bubble around ourselves, saying, eh, I’m going to let that one slide. Yeah, right, pick your battles, right? Good advice, good advice. Doctor, give out your website, if you would. Sure, it’s drmeletis.com and I post routinely everything on health topics on my social media, my Twitter account and I have some international articles there, access to videos I’ve done, books, and so yeah, that’s what I do. I love sharing, educating people, and when the patient and the consumer is educated, that’s when true health begins. Maybe I’ll ask you to close just on this one and that is the subject we didn’t talk about yet about fertility for men and women, environmental factors can affect it and what can be done about it, if anything? I love the term fertility and I wrote a book on fertility. The concept here is what is fertile? Just like we were talking about produce and gardens and ground and so forth. Fertility is how fertile are you and it’s not just can I get pregnant, but where am I planning to seed ? Where am I planning to baby, how toxic am I? And so, what I tell my patients, you know, six months ahead of time when you’re thinking about conceiving, male and female like, you make sure you have a cleaner diet, cleaner life style, and you are actually are creating an environment which when the fertilized egg gets implanted, it’s not toxic. In fact, I tell my patients never lose more than 5 pounds within the six months you’re going to try to become pregnant for females, because you’re going to liberate toxins and basically what I call metabolic pollutants from your fat, put them through circulation, and no, you want everything to be quiet and pristine, you wanna be eating well so that you’re as fertile, not only from being able to conceive, but to actually nurture the little one as it grows. Good stuff. Well, Chris Meletis, thank you so much for joining us today.